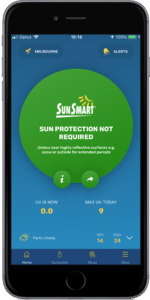 The free SunSmart app tells you when sun protection is recommended for your location using forecast information from the Bureau of Meteorology website and live UV data from ARPANSA. Live UV levels from 12 monitors across Australia (including all capital cities), sourced from the trusted Australian radiation agency, the Australian Radiation Protection and Nuclear Safety Agency. Sun protection times for more than 600 locations across Australia, providing you with an easy way to find out when you do and don’t need sun protection each day. 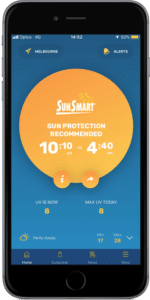 Alerts you can set to remind you when sun protection times start each day, or set to be reminded about UV on any day of the week. 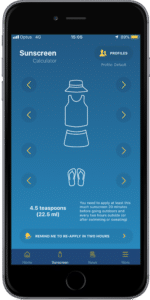 Sunscreen calculator, which provides you with the minimum recommended sunscreen application recommended, based on your choice of outfit. Plus, set a two-hour reminder so you don’t forget to top up. You can add multiple profiles to the calculator to help the whole family keep track of their sunscreen application. Four-day forecast of sun protection times and weather information, sourced from the trusted Australian weather agency, the Bureau of Meteorology. News page to help you stay up to date with the latest advice from SunSmart. Add the free SunSmart widget to your website! 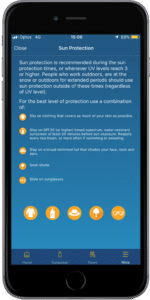 The widget shows the live UV level and sun protection times for your location in Australia, making it easier than ever to be smart about your sun exposure all year.